Some people have been asking me exactly what is Oddmall? The usual response is Oddmall is more than just an ordinary craft show. It’s a celebration of uniqueness, creativity, imagination, and wonder where artists, crafters, and like-minded sorts gather to offer their unusual creations for public consumption. It’s a forum for creative expression, a classroom for esoteric wisdom, a soapbox for wild ideas, a miraculous marketplace of the unconventional, a metaphorical Serengetian watering hole where the zebras and wildebeests of inspiration and artistry congregate amidst the snapping crocodiles and scorching sunbeams of originality and ingenuity… umm yeah. Anyway, it’ll be fun. Trust me. 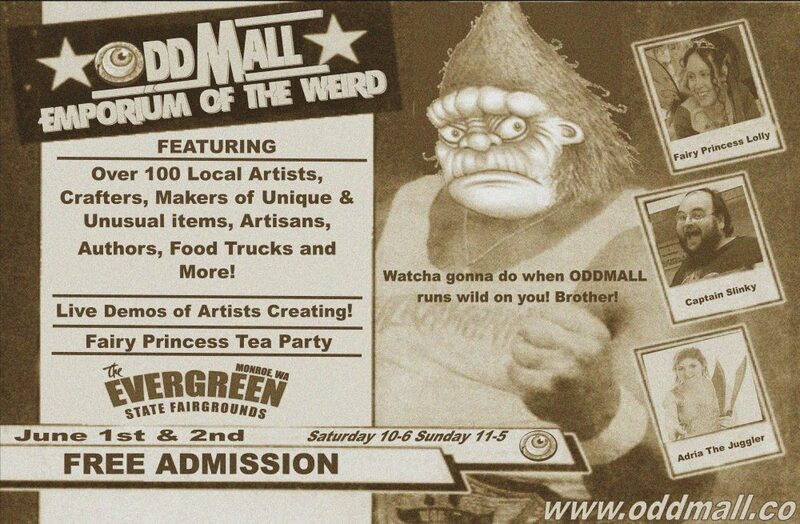 But for those of you that just want the lowdown, Oddmall is basically a pop-up shopping mall for handmade items and art and then throw in some great entertainment and the best part is Oddmall is free to get in to shop! We have vendors from Washington, Idaho, Oregon and more coming to Everett to share their hard work with you. Come out and see for yourself what Oddmall is all about. We still have plenty of room for vendors too! Would you like to join us at the Emporium of the weird? Learn more by clicking on the registration tab above.